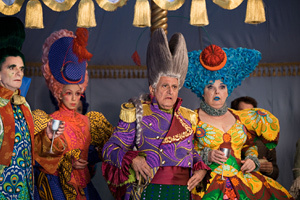 Call her “Snow.” That’s what everyone in the movie Mirror Mirror does, so you might as well join the crowd and bring a heavy helping of contemporary informality to a classic fairy tale. We’re talking about Snow White, the mythic beauty who probably is best known for being a character in Disney’s first full-length animated feature, which hit the nation’s screens in 1937 and spawned one of the most durable trivia questions ever: Name all seven dwarfs. I usually forget Bashful, but that’s another story. The Snow White story has been through a variety of mutations, and now arrives on the screen as a tale narrated by the evil queen (Julia Roberts), a woman who presides over her kingdom from a golden clamshell of a throne and who becomes the main attraction in a movie dominated by outlandish costumes, lavish sets and hairdos so preposterous they look as if they belong in a topiary. It’s almost as if the filmmakers knew they lacked a great story and decided to dazzle us with production-value footwork. We’re even treated to a CGI monster for Snow (Lily Collins) to fight. That’s right. Director Tarsem Singh (The Cell and Immortals) has concocted a version of the Snow White story that turns pretty, pure Snow into a warrior princess. The screenplay by Melissa Wallack and Jason Keller also transforms the seven dwarfs into mini-warriors and bandits who leap about on stilts and, most irreverently of all, turns the handsome prince (Armie Hammer) into a bit of a bumbling doofus. The movie thrives on upending fairy-tale conventions, toppling or toying with some of the genre’s hoariest cliches. Fairy-tale bashing is always welcome, but this edition of Snow White is more about production design than anything else, and despite a lot of trying, Mirror Mirror can’t sustain the spirit of abandon that would have made it soar. The movie creeps right up to Tim Burtonesque weirdness without quite going over the oddball edge. The dwarfs? They’re much less cuddly than in the Disney version, which, I suppose, can be considered a form of progress. But the film doesn’t go quite far enough with its wit and has almost no flare for satire. I had no say in the matter, of course, but if it had been up to me, I’d have scrapped “Snow” and gone with Ms. White — at least once or twice.